Entering data is a frequent user action during web browsing (e.g. for logging in, registering, booking etc.). The primary way of entering data inside the browser is through forms. Form-filling is an important activity, but it is comparatively difficult on mobile devices. Traditionally, the virtual keyboard on mobile has a default “Go” key at the bottom-right, to let the user submit the form. On the above screen, we can see that we didn’t yet complete the form. At this point, the only option for the user to conclude the editing of the current field is to either touch on the next field manually, or press the “Go” key. However, the “Go” key tends to submit the form and we didn’t complete the form yet. When there are multiple elements inside a form, it’s better to navigate through all the elements before concluding the entire form, because there may be additional fields that we need to input. If we know that there are more fields to be filled in before submitting the form to the server, the “Go” key is irrelevant at this stage. It is a blind attempt to submit the form, without analysing the form contents. If instead we can control the “Go” or “Enter” button during form-filling, we can make a better experience for the user. Rather than showing “Go”, if we can show “Next” when there are still-unfilled input fields, then the user can more easily navigate to those subsequent fields. 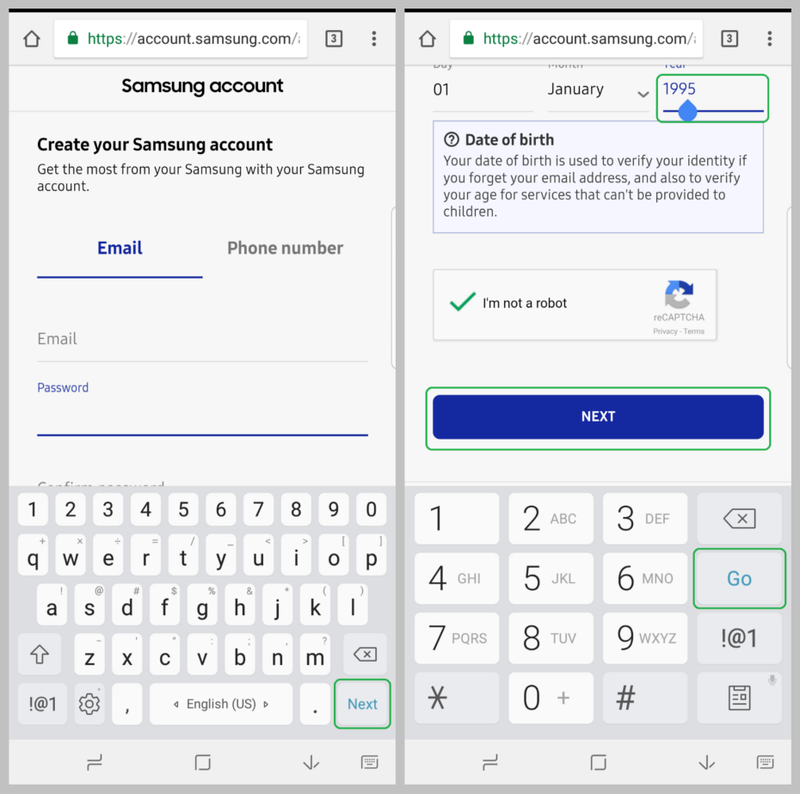 Samsung Internet already has a Smart Form Navigation feature, enhancing the virtual keyboard by including “Previous” and “Next” buttons on top. This is to ease the navigation between form control elements (input, textarea and select elements). The above screen shows how Smart Form Navigation is helpful to the user. There are form fields before and after the currently-focused form field. “Next” will take the user to the next focusable, editable field — and “Prev” to the previous — without having to manually focus on the target field. Chromium wanted to stabilise virtual keyboard attributes and posted a feature request here on the Chromium bug tracker. Since Samsung also works on a similar area, we had shown interest to extend our contribution to this feature in Chromium. Since Samsung Internet is now available in the Play Store to a majority of non-Samsung devices (including HTC, Nexus, Pixel, LG, Motorola, Xiaomi, Sony etc), it’s hard to support Smart Form Navigation, because those device-specific virtual keyboards won’t support “Next” and “Previous” buttons on top of the keyboard. With Smart Go Next, we can now bring smart form navigation to any standard Android-compatible virtual keyboard with more or less the same accuracy. Even on a Samsung device, if the user wanted to use a different virtual keyboard other than the default Samsung one, with Smart Go Next they can get a similar experience. With Smart Go Next, we help the user to navigate to the next input fields. Basically we replace the “Go”/”Enter” key with the “Next” key wherever possible. Only when the user reaches the last field of the form, will we show the “Go” key. For example, on the screen on the right, the user has completed the form and there are no further elements to be addressed. Hence the “Go” key is very much suitable at this point. In a nut shell, this feature targets form control elements inside any web page, including login forms, registration forms, payment forms etc. This feature is enabled by default in Chromium by now on all Android devices along with all keyboards which comply with Android virtual keyboard standards. Due to Android’s virtual keyboard limitation of not allowing there to be both “Next” and “Go”/“Enter” keys displayed together, we can only show one of these keys at a time. Currently this feature is restricted to editable form control elements (i.e. input text, textarea, content editable). So other focusable form control elements (e.g. select element, button etc.) will be ignored. Smart Go Next will be shipped in Chrome 62 stable channel after the current trial of Chrome 62 beta channel. Samsung Internet based on Chromium 62 will get this feature too. This means that non-Samsung devices will be able to experience Samsung Internet’s Smart Form Navigation using Smart Go Next.